I've been keeping my eyes on the playoffs, and the Baltimore Sun has a real nice piece (written by Dan Connolly) on former closer George Sherrill in today's online edition. As most know now, Sherrill is now the setup man in Los Angeles for huge Jonathan Broxton. Now Sherrill said to the Sun that he didn't want to leave Baltimore, and the fans didn't want to see him go either -- but, hey, it's all business, and sometimes a cruel one. It's been a few months since he was traded, and even now people in Birdland still don't care for the deal made. Whether the deal pans out in the future or not, I think fans here right now just want to see a winner and have hope in the American League East. Guess who's back in the World Series after six years -- yes, the Yankees. They are one step away from fulfilling their manifest destiny as they beat the Angels, 5-2. The Yankees, down 1-0, in the fourth inning, scored three times in the that frame to take the lead and never look back. They scored twice more in the eighth to widen their lead, and Mariano Rivera came in to close out the game, plus the series. Too bad for Los Angeles, they could have had a storybook ending considering what happened with them along with the Adenhart tragedy; however, they were bested by a team that was way, way too strong. I thought they would have put up more of a challenge, but the New Yorkers from top to bottom were just too good. B-Rob and His Year; Looks Like a Good Deal Right Now. When Brian Roberts got his contract extension last year, I thought that the Orioles might pay down the road for giving him a deal – 4 years – that started in 2009. I thought Brian’s deal might turn into one the team would later regret, sort like what happened this season with Melvin Mora that served as a case of buyer’s remorse. When everything was said and done, I thought Roberts had been signed for one year too long with a contract that was a tad generous. Obviously, there’s a good amount of time left on Roberts’ deal before it expires; however, right now, it looks like he’ll stay healthy, and he should post some very strong numbers in the years to come. However, from what I saw in last season, Roberts put in one his best efforts at the plate, despite the Orioles’ record. Although there were some fans that questioned his hustle and wondered where his mind was at time, he no doubt delivered time and time again offensively. Even though he’ll be 32 when the 2010 season begins, the man shows no sign of slowing down, based on his doubles record, along with his .283 average, 16 homers, 79 RBIs, a .807 OPS, and 30 stolen bases. The New York Yankees will try to decided the American League pennant as the League Championship series returns to New York City. As we all know, the Yankees had a chance to take Game Five of the series after an impressive six-run seventh inning to take a 6-4 lead, which later was washed away by a terrible A.J. Burnett and the implosion of the New York bullpen which allowed three runs to come in the bottom of the inning. We'll see what goes on tonight; however, it is supposed to be real nasty out -- though not nearly as chilly as the first round of the playoffs in the Bronx. The backs of the Angels are still against the wall, and I still think New York takes the series thanks to their offense. Los Angeles has not been pretty in the ALCS, and the Yankees have neutralized them in the series; however, they are a very good team, and they did win 97. If there's a Phillies-Yankees World Series, I can't the stomach the fact both those teams are in it. Really, because I hate everything about Philadelphia sports, I have to commit heresy and root for the Yankees. It looks like the sands of the hourglass is quickly coming down the Dodgers season. When George Sherrill is pitching in relief during the 4th inning, you're desperate. It makes it even worse that he hit Shane Victorino -- who conveniently didn't move out of the way -- with the bases loaded. I've been away for a few days on travel, but right now the 2009 playoffs have been extremely compelling for the most part, with every game coming down to crucial-at-bats, timely hitting, and of course pitching and more pitching. It's amazing to see how far, far different playoff baseball especially with the elite teams than it is (no offense) watching the Baltimore Orioles day in and day out. I've got in my mind now that we're going to see a Yankees-Phillies World Series, which would kind of be nice for me that I might have the chance to catch in game in person. I think the New York Yankess take it all simply because Alex Rodriguez is finally coming together at the most critical time, and besides -- perhaps -- Albert Pujols, he is the BEST all-around player in the last generation. I know some Yankee fans over the years have flamed, tarred and cussed at Rodriguez for his failings in the playoffs; however, he's looking to be the man now. The Yankees may have a store-bought team, but their guys produce ans execute. I don't know if I'd give Joe Girardi credit for helping the Yankees, but I think their core -- Jeter, Rivera, Pettitte, Rodriguez, and Posada -- know what to do to win. Also, it looks like Cano returned in 2009, and the reserves they've plugged in have delivered. The whole team is clicking the playoffs, and their bullpen is much, much better than expected -- in fact, they look better now than they did in the regular season. I do think the big X-factor for the Yankees was the acquisition of C.C. Sabathia. I really thought he should have never left the National League, and was going to struggle again in the American Lrague at times. For most part, he's been very good in the American League and while his numbers are nowhere near as dominating as he was with the Brewers last season, he's showing in these playoffs why he's getting paid the big bucks. Phillies vs. Dodgers: The Dodgers scored twice in a bizarre eighth inning where the Phillies used five relievers to try to hold onto a slim 1-0 lead. Honestly, Philadelphia’s effort on the field in the frame was just ugly as they gave up two lead-off singles (a single by Casey Blake and a bunt by Ronnie Belliard) and moments later, Chase Utley would field a ball from Russell Ma rtin and try to complete a double play. However, Utley’s throw to first would completely sail by Ryan Howard and allow Juan Pierre – who was pinch running for Casey Blake – to score and tie the game. As a band of relievers came in for the Phillies, they would give up another hit, walk a batter, and struck out one before Andre Ethier came to the plate. J.A. Happ came in for Philadelphia and his job was to only get one out – Ethier – however, he would walk him and give the Dodgers a 2-1 lead. The Philadelphia Phillies took the first game of the NLCS over the Los Angeles Dodgers, 8-6, thanks to a big fifth inning, and two three-run homers by Carlos Ruiz and Raul Ibanez. The Dodgers were helped out by a huge Manny Ramirez home run in the fifth and rallied in the eighth inning to come within two; however, Brad Lidge – who everyone knows struggled in 2009 in save opportunities – was not perfect in the ninth inning on Thursday, but got the very important save. Philadelphia’s Cole Hamels got the win; however, he was far from good as he only 5 1/3 and gave up four runs on eight hits. Los Angeles’ Clayton Kershaw shined for four innings, and then struggled mightily in the fifth inning and took the loss, only going 4 2/3 innings and allowing runs on four hits. The Dodgers took a 1-0 lead off a solo homer by James Loney in the second inning; however, Kershaw lost his effectiveness in the fifth inning as he got a tad wild. He allowed two men to get on base, and then catcher Carlos Ruiz took him deep for a three-run homer to give Philadelphia a 3-1 lead. Yesterday afternoon, a co-worker and I were talking about the Ravens and football in general; however, in the course of out conversation, our sports chat somehow went on another tangent and migrated towards the Baltimore Orioles. While my co-worker truly believes that things are getting better with the Orioles, he had some deep reservations about the fact that Dave Trembley's option as manager of the team was picked up for 2010. The co-worker said, much like I heard on a multitude of blogs and talk radio, "I like Dave Trembley, but I cannot believe that he's still manager of the team. He seems to be a great guy, but the team is so bad. They don't have any fundamentals, they don't have any pitching, and I just think we needed a change." Now, he didn't think that Trembley was incompetent or terrible, just that he thought the organization could find a better leader on the field. I asked him who would you replace him with, and he didn't give much of an answer -- he brought up a few names: LaRussa, Leyland 8 Fredi Gonzalez (and he said, "oh, we also could have had Girardi..."). Then again, all the aforementioned names are employed by other organizations -- winning ones. I was not suprised to hear this, but I told him at this point, it looks like the Orioles are going to give him another shot, and this year is certainly not based on wins and losses, but to see what they had. Now, I don't think my co-worker was that impressed with my logic; however, he just wants to see wins rather than the big picture, and I would not blame him for his opinion. Then again, I might be in the minority as to how fans feel about Dave Trembley. It might have been assumed he'd be back anyway, but of course no one really knew that except the principals -- the front office executives, MacPhail and Trembley. We don't know what goes on in the clubhouse or in meetings, so I guess we all have to go on by what we see. Well, James Baker of Oriole Magic and I met over the weekend -- after the Orioles 162nd game on Sunday, and we came to the conclusion that the decision to bring back Trembley was made well before the announcement. I think the Orioles knew what they had down on the farm, and in hindsight the team was going to struggle in the AL East anyway, and that should really have no bearing on his job status in '10. I was listening to the radio this weekend, and Tom Davis along with Dave Johnson felt what we saw in course of the summer was the Orioles giving young players a chance to prove themselves -- wins and losses were not really a factor. It looks like the Orioles have already made personnel changes, and it looks like coaching staff will not the same when Spring Training along with the 2010 season comes around. I guess there were going to be changes come about from a 98-loss season (and a 12th under .500), so there will be more. From the Baltimore Sun: All but one of the Orioles 2009 coaches will be back on Dave Trembley's staff next season. Trembley said Tuesday that Dave Jauss, who has been Trembley's bench coach for the past two seasons, will not return in 2010. The rest of the group will resume their 2009 responsibilities: pitching coach Rick Kranitz, hitting coach Terry Crowley, first base coach John Shelby, third base coach Juan Samuel and bullpen coach Alan Dunn. None will be considered for bench coach. Therefore, Trembley will be searching only for a right-hand man, who also likely will serve as the spring training coordinator. Trembley said there is no specific timetable for the hiring. "We'll take our time, compile a list of potential candidates for the bench coach position," Trembley said, "And as the offseason progresses, we'll make a decision." There's one man on the staff who received a lot of heat for some of the baserunning gaffes -- Juan Samuel -- who will be back in Baltimore next season. I know some fans were angry about his work as third base coach, plus overall lack of base-running fundamentals, but I'd like to see if things turn around in '10. I cannot remember anyone complaining about Samuel the year prior; however, with the losing and what was seen this season, let's hope the team shows some more discipline. The Rockies were eliminated in the NLDS, as they lost to the Phillies, 5-4. Philadelphia advances to the NLCS where they'll face the Los Angeles Dodgers for the second year in a row. The Rockies were shocked, and after a three-run rally in the eighth, Huston Street and his team could not hold the lead and allowed Philadelphia to score three times in the ninth. Pitcher Cliff Lee – who was impressive in Game One – looked every bit the ace he’s purported to be and that was the case until the eighth inning. With Philadelphia up 2-1, Lee fell into some trouble as he allowed a few runners on base in the eighth inning—primarily due to a huge error by Jimmy Rollins, and then they went to town on Philadelphia. Rockies’ Pinch-hitter Jason Giambi singled to center to plate in a run, and Yorvit Torrealba hit two-run double to give them a 4-2 lead. However, the Phillies jumped on Huston Street in the ninth, and with two runners on and outs, he allowed Ryan Howard to hit a two-RBI double in the clutch to tie the game. Jayson Werth, the next batter, blooped a single to right plating Howard, to give them a 5-4 lead. In the end, Lee tookthe no-decision as he went 7 1/3 innings and allowed three runs – only one earned. Philadelphia reliever Ryan Madson got the win, Brad Lidge got the save, while Colorado's Huston Street took the loss. Angels vs. Red Sox: The Red Sox were eliminated in the ALDS,as they lost to the Angels, 7-6 and were swept. Red Sox Nation was shocked, and the with the Angels' backs against the wall in the ninth inning, they broke through and sent Papelbon reeling. Papelbon blew a potential save with 2 outs in the ninth, allowing three runs to come in. He made the ninth inning very interesting as he gave up a RBI-double to Bobby Abreu to bring the Angels within one, and allowed the winning runs to come in via a two-run single fromVladmir Guerrero. Papebon would take the loss, while Kevin Jepsen -- who was pitching in relief for the Angels in the 8th inning -- earned the win. Brian Fuentes -- the Los Angeles closer -- got the save. Clay Buchholz got a no decision in his first taste of the playoffs as he went five innings, and gave up two runs. Meanwhile, Scott Kazmir, who has had a lot of good luck against the Red Sox – as a member of the Rays before he got traded to the Angels – got the no decision as he gave up five runs (all earned). The Red Sox got Kazmir in the third inning to take a 3-0 lead as Dustin Pedroia had an RBI-double to center, and then Victor Martinez plated him in with single. However, in the fourth inning, Kendry Morales hit a solo homer to right off of Buccholz to give Los Angeles their first run of the game. The Red Sox raised their lead in the fourth inning to 5-1 as J.D. Drew hit a two-run shot off Kazmir to dead-center field over the outfield wall. However, in the sixth, Clay Buchholz ran into a bit a trouble and loaded the bases; therefore, he was yanked from the game and reliever Daniel Bard came into the game. Bard got Juan Rivera to ground into a double play and allowed a run to come in, but was able to get the third out of the frame by getting Macier Izturis to pop-up. The Angels got on the Red Sox bullpen in the top of the eighth inning as they allowed a few baserunners and then Juan Rivera plated in two runs with a two-out single; however, Rivera was lifted for a pinch runner – who was Reggie Willits, but he would be picked off by Jonathan Papelbon. Boston added in an insurance run in the bottom of the eighth as Mike Lowell plated in pinch-runner Joey Gathright – in for David Ortiz – to give them a 6-4 lead. The Los Angeles Dodgers were the first team to claim a spot in the League Championship Series as the Dodgers offense backed by big nights from Andre Ethier and Manny Ramires; however, an excellent outing by pitcher Vincente Padilla led them over the St. Louis Cardinals, 5-1. Padilla – who was exiled from the Texas Rangers, but caught on with the Dodgers late in the season – delivered as he went seven shutout innings and gave up only four hits. Joel Pineiro, who tried to help St. Louis extend their season, took the loss and only lasted four innings on the mound where he gave up four runs. Albert Pujols went 2-for-4, but the rest of his teammates had trouble getting anything going at the plate. The Dodgers drew first blood as Manny Ramirez plated in a run off a RBI-double off Pineiro for their first run across home plate, and then raised the score to 3-0 in the third inning as Andre Ethier hit a two-run homer. They took a 4-0 lead in the 4th inning as Rafael Furcal singled in a run, and after that frame Pineiro would be yanked from the game. The Dodgers would get Andre Ethier on base with an RBI-triple, and then Manny Ramirez plated him with a single for a 5-0 advantage. St. Louis got a run finally in the eighth as Albert Pujols plated in Julio Lugo; however, by then, it was too little, too late. The Dodgers should have a few days to rest as they await the results of the Phillies-Dodgers divisional series matchup. The New York Yankees took game two of their series with Minnesota thanks to Mark Teixiera’s walk-off homer off Jose Mijares in the bottom of the 11th, as they won 4-3, ending a night of high drama. It was an interesting game, and one as good as the contest the Twins had against the Tigers on Tuesday, but the New Yorkers battled, and the Twins – who had the bases loaded in the top of the 11th – could not muster umpteen chances they had to score. A.J. Burnett was shaky, as he was wild at times, however, he was surprisingly able to be effective and got a little help from his defense, as Minnesota had two runners on base, with Delmon Young about to score in the fourth inning thanks to a Matt Tolbert base hit; however, base runner Carlos Gomez tried to be greedy and advance to third, but slipped. 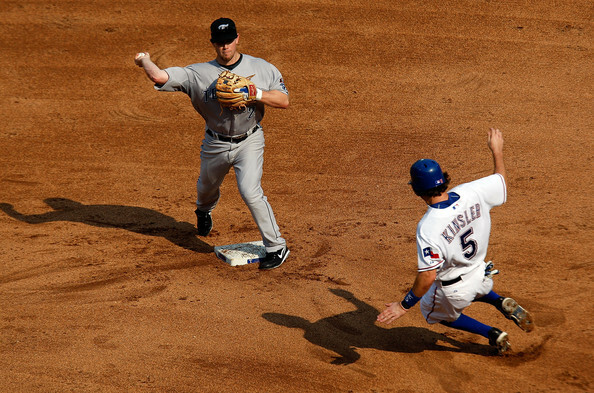 Moments later, Nick Swisher fielded the ball, threw it to Jeter and tagged out Gomez. 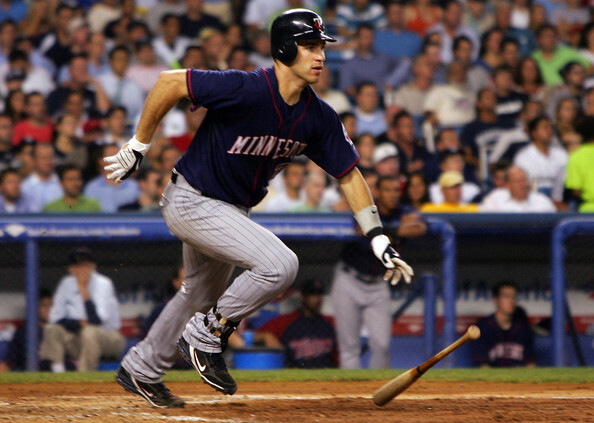 In the sixth inning, pinch-hitter Brendan Harris drove in a run with an RBI-triple off the left wall that got past Johnny Damon to put Minnesota up 1-0. The Yankees tied the game 1-1 as Alex Rodriguez – the formerly beleaguered hitter in the playoffs – came through with a two out RBI-single. Moments later, Blackburn was yanked, but more damage was averted. Minnesota took back the lead, 2-1, thanks to a two-out RBI by Nick Punto off reliever Phil Hughes with two runners on base. Well, a minute so or later – after Mariano Rivera came into the game – Denard Span plated in another run with an RBI-single to give them a 3-1 lead. However, Minnesota would cough up the lead in the bottom of the ninth as Joe Nathan gave up a home run – a two run shot – to Alex Roridguez to tie the game at three. The Minnesota closer also pitched the tenth inning -- and he was terrible -- however, although he let runners get on base, the Yankees could not finish off the Twins at that point. A.J. Burnett for the Yankees lasted six innings, and gave up a run, but he walked five and struck out five. Nick Blackburn, who started the game for the Twins, went six innings as well and gave up only a run. Dave Robertson got the win in relief for New York; meanwhile, Mijares took the loss for Minnesota. Rockies vs. Phillies: The Colorado Rockies went into the City of Brotherly Love Thursday afternoon and pulled off a close 5-4 victory to tie their series at one. The Rockies took an early 4-0 lead off P hiladephia ace Cole Hamels, greatly aided by Yorvit Torrealba's two-run homer in the fourth inning, and never looked back. The game looked bleak at points for the Phillies; however, they fought back hard, but fell short. Trailing 4-0, the Fighting Phils came within one of the lead in the sixth inning as they were bouyed by RBI-double by Ryan Howard and a two-run single by Raul Ibanez. Colorado got an insurance run off a Dexter Fowler sacrifice fly in the seventh, and Jayson Werth for Philadelphia homered in the eighth inning off Rafael Betancourt. The Phillies tried to rally in the bottom of the ninth as they got runners on first and second off closer Huston Street; however, Shane Victorino lined out to Colorado second baseman Garrett Atkins to end the contest. Cole Hamels took the loss as he only went five innings and gave up four runs; however, the day was not all bad for him as he left the game to be with his wife -- who was in labor at a hospital. Meanwhile, Aaron Cook earned the win as he went five innings and gave up three runs. Huston Street got the save in the ninth inning. Poor Matt Holliday. He's a great offensive player and all-around good guy, but could he have perhaps cost the Cardinals a chance to advance, much less Thursda y's game. Yes. They had two outs, and the Cardinals just needed one to end the game; however, Holliday dropped a flyball by James Loney and let him advanced to second. Things fell apart from there, as Ronnie Belliard plated in the tying run and with the bases loaded, veteran Mark Loretta drove in the winning one, as the Dodgers beat the Cardinals, 3-2. The Cardinals wasted a great start by Adam Wainwright, who went eight strong innings, was beyond nasty and put them in a position where they could have tied the series. Now, they have to survive. They took a 1-0 lead in the first inning off a Matt Holliday solo homer; however, the Dodgers tied the game at one as Andre Etheir homered -- a solo shot. The Cardinals took a 2-1 lead in the seventh as Colby Rasmus' deep double plated in a run. The Dodgers' Clayton Kershaw -- the young southpaw -- started the game and was solid, going 6 2/3 innings and allowing two runs on nine hits. Observing that way Kershaw pitched on Thursday, I see future star written all over him. Obviously being on the East Coast, I don't see a lot of the Dodgers, but did Kershaw ever impress me. Phillies vs. Rockies: The Philadelphia Phillies opened up the 2009 playoffs by defeating the Colorado Rockies, 5-1, in the first contest of a five-game series. Starter Cliff Lee of Philadelphia showed why he was the big fish traded for at the trade deadline as he pitched a complete game, going nine innings and gave up a run off a Troy Tulowitski RBI-single in the ninth inning. Overall, Lee struck out five and had no walks. Amazingly, this was his first playoff starter, as he was left off the 2007 Cleveland Indians playoff roster. Philadelphia's high octane offense did the work and gave Lee an assist as they scored twice in the fifth inning, and scored three times in the sixth to decide things. Colorado's Ubaldo Jimenez who started the game, rolled through the first four innings, and matched Lee pitch for pitch; however, the Phillies jumped on him and sent him to the showers in the sixth inning. Jimenez only lasted five innings, and took the loss, giving up nine hits, but struck out five and walked one. Philadelphia's Raul Ibanez drove in two, and Ryan Howard, Jayson Werth along with Carlos Ruiz drove in a run each on Wednesday. Twins vs. Yankees: The expectations for the Yankees are huge in 2009, thanks to their outrageous payroll and their free agent acquisitions; however, on Wednesday, their march to a 27th championship started off in splendid fashion as they defeated the upstart Minnesota Twins, 7-2. The Twins, a day after their amazing win over the Tigers to take the AL Central, perhaps looked a little fatigued. For the Yankees, C.C. Sabathia -- he, of the largest contract ever given to a pitcher -- put aside some of his postseason failures, as he came through huge going 6 2/3 strong innings, giving up eight hits, two runs, and striking out eight. The Yankees used their bullpen -- four pitchers in total, including Joba Chamberlain and Mariano Rivera to take the first game of the series. I spent a bit of time this morning chatting with co-workers about the Twins-Tigers game last night, and needless to say, it was universally thought among us it might have been one the greatest spectacles we've ever seen on TV. As much as I would like to see the small-market Twins and their scrappy ways perhaps upset the New York Yankees, I don't think it's going to happen. The Yankees are just too stacked lineup-wise, the pitching has been relatively solid, and of course they have Mariano Rivera to close out games. Now, one could consider that Alex Rodriguez may be hit with another slump, and the pitchng may be shaky; however, New York just seems and looks too good. Then again, if the Twins can counter against C.C. 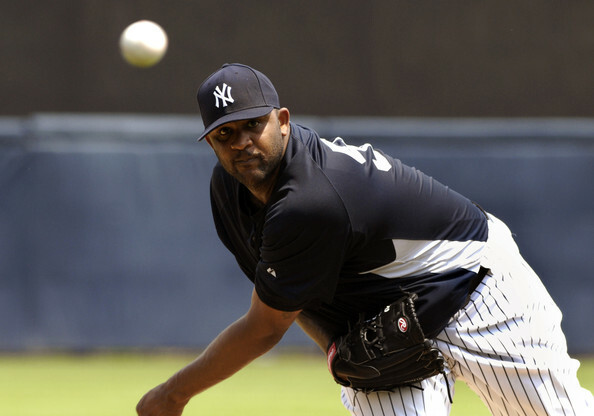 Sabathia in Game One, and perhaps take a game in Minnesota, things will become very interesting. However, the Twins may be tired after Tuesday night, and seeing how much rest the Yankees have had, I don't see how the Twins can take the series. ALDS Series Two: Boston Red Sox vs. Los Angeles Angels of Anaheim. Red Sox in 5. I think the Red Sox take the series because of superior pitching -- Beckett, Lester, a healthy Dice-K and perhaps even Clay Buchholz; however, they will run into trouble with the athleticism of the Angels and their patience at the plate. A lot has been said about the ability of both Victor Martinez and Jason Varitek at the plate and how the Angels may run on them at all, but I do think the Red Sox have enough of a balanced team to take it. Again, I'd be curious to see how the Red Sox offense does, because that may decide the series. Boston must have David Ortiz healthy. The Minnesota Twins are heading to New York to face the Yankees. They won against the Detroit Tigers in 12 innings, 6-5. Well, I'll say, I got home today and watched the game -- perhaps the greatest regular and riveting season game I've ever witnessed -- from start to finish. Alexi Casilla plated Carlos Gomez for the winning run off Detroit reliever Fernando Rodney and the Metrodome went crazy. You have to give props to both teams as they showed heart, mettle, and it was a game to be remebered for all time. Minnesota wins the AL Central and earns the final playoff spot. Considering this is the second year in a row where they have played 163 games, it was a well deserved honor. There were so many moments that could have decided the game for teams, and it was incredibly well managed by both the Tiger's Jim Leyland and the Twins' Ron Gardenhire, but in the end, the Twins got the break they needed as they tagged Fernando Rodney for a few hits that decided everything. Major League Baseball gave out some hardware today, and the 'Comeback Players' of the Year were named. A special congratulations to the Cardinals' Chris Carpenter -- who pretty much missed two years and just flat out dominated on the mound in the National League -- and the Jays' Aaron Hill, who seemingly came out of nowhere to rake at the plate in 2009. Looking back at 2009, there's a lot to go through, ponder, and look back in anger about; therefore, I probably will spend a good bit of time just giving my opinions about the season. There was some good, a lot of bad, and even ugly; however, I guess my first entry this offseason will focus on Matt Wieters. Wieters, as we all know, was touted as the next Johnny Bench -- only taller and a lot wealthier -- and the expectations on him were so lofty and outrageous that they seemed ridiculous in my mind. Yes, he started off slow, and seemingly had his troubles at the plate, but towards the end of the season, he looked like a new man. Folks, he raked. His average howevered in the .240-260 range for much of the summer -- it was not bad for a rookie, but not earth-shattering, but then it creeped up to the .270 range. Then September came around and Matt turned it at the plate on to the tune of a .359 average, and moreover, he showed power and hit the ball with amazing authority to all fields. He had an outside chance of hitting the .300 barrier with a hot weekend at the plate, but when Sunday ended, he ended his rookie season with a .288 average, 9 homers, 43 RBIs, a .340 OBP, and an OPS of .753. Those numbers are not too shabby for a rookie ballplayer whose major league career began in June. Furthermore, when the Orioles moved up him in the order to bat third -- even during the losing streak -- he managed to shine and deliver. As well, he looked very impressive behind the plate at times, and also had to deal with one of the youngest starting rotations in the majors. It remains to be seen where he'll bat in the order in 2010; however, one could assume it could be anywhere from the 3-to-6 hole (I don't see him hitting cleanup, but never say never). 2009 was a job well done by Matt Wieters, and if the past few weeks are any indication when it comes to the talent level and potential of the young man, the future could be very bright with the Orioles. Although the season is over for the Orioles, the 2009 Playoffs are heating up, but before that starts, there will be a battle this afternoon to settle the American League Central as the Detroit Tigers take the Minnesota Twins at the Metrodome. Now, I assumed that the Tigers all had the division wrapped up in early September; however, they started to tank, and a Twins hot streak -- made even more impressive with Justin Morneau's absence due to injury -- in the past few weeks have them primed for a postseason trip. All things considered, Ron Gardenhire -- Minnesota manager -- should earn the Manager of the Year Award for his leadership and getting the most out his team (I'm not trying to disrespect Mike Scoiscia -- especially after what he has had to endure with the Angels). It's too bad that the 2009 playoff rendition -- aside from perhaps the Rockies, and barring a Minnesota win today -- is one for the 'haves' in baseball; however, there are several compelling storylines (Angels/Red Sox -- again, seeing the powerful Cardinals with the batting duo of Pujols/Holliday and the arms of Wainwright/Carpenter, Manny Ramirez and the Dodgers, and of course the Evil Empire) to keep everyone entertained. After enduring a 13-game losing streak, the Orioles won their fourth straight game - and the penultimate one of the season - 5-4, thanks to an unbelievable 11th inning where the Orioles used two bunts aided by back-to-back errors by Toronto reliever Brandon League. League, who was on the mound in the deciding frame, threw away two balls - one by Lou Montanez and the other by Jeff Fiorentino - to stun the crowd. It goes without saying that the Blue Jays literally gave away the game on Sunday. After the drama last week, and the re-hiring of Dave Trembley as manager, the Orioles started off as hot they took a 2-1 lead thanks to Nick Markakis's two-run homer (his 18th), plus he was able to cross the 100 RBI plateau. However, the Jays got on the board first as Edwin Encarnacion homered in the first inning, and then they tied the game at two thanks to a Travis Snyder RBI-double. They upped their lead to 3-2 in the fifth inning off a Jose Bautista solo homer. 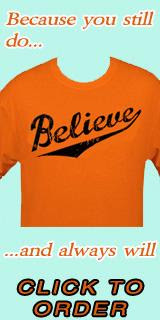 Baltimore took a 4-3 lead thanks to a two-RBI double by Justin Turner; however, the Jays' John McDonald homered to left. Jeremy Guthrie started the game for the Orioles, and went 7 2/3 innings, but was plagued by the homer ball - again. He gave up 35 in the 2009 season, and while he's looked a lot better in the second half, overall, his year was a complete disappointment. The man works hard, and cares immensely about his work, therefore, I'm sure Guthrie will get himself in order, see where he went wrong, and try to correct the errors that led him to a 10-17 record. On the day that Dave Trembley's managerial stint got extended into 2010, his players responded in a big way as Michael Aubrey drove in six runs -- via two homers -- Matt Wieters had a 3-run homer, and Jason Berken earned the win (his 6th) as the Orioles defeated the Toronto Blue Jays, in the first contest of a three-game set, 13-7. According to multiple team sources, the Orioles will pick up Trembley's option for the 2010 season, a surprising development that ends weeks of speculation that heightened with each Orioles loss. The decision comes one day after the Orioles ended a 13-game losing streak -- the third longest in team history -- and with three games remaining in the season, the Orioles' 12th straight losing campaign. Several people in the organization felt that the losing streak would ultimately be the final factor in MacPhail's decision to not retain Trembley. However, MacPhail, who made a couple of in-season moves that weakened the team in the present but he hopes will strengthen it in the future, felt that Trembley deserved another opportunity to prove that he could be the Orioles' long-term answer. Good for him. The right, and equitable decision was made. Even better, the decision was made before the season officially ended -- not after. There was no use stringing Dave Trembley through waiting for a decision, and to have the media onslaught on him any longer. He's now got piece of mind and can now focus on keeping his job rather than wondering if his days are numbered. Trembley deserved the opportunity to prove himself next season with an actual, healthy, and viable major league roster. There was no way anyone could have saved the Orioles from such a dramatic fall in the second half of 2009; therefore, I think improvement will need to take place in 2010, or this time Trembley will actually be gone. Finally, the worst losing streak for the Baltimore Orioles in two decades has come to an end. It was painful to see, and they've gotten a lot grief for it, nevertheless, they won against the Rays, 3-2. Chris Waters was solid in a spot start as he went five innings and allowed only a run -- courtesy of a Ben Zobrist solo homer (his 27th) in the 4th inning. Of course, things naturally got interesting in the ninth as Jim Johnson came into the game to wrap it all up for Baltimore, and had a bit of trouble. He allowed a few runners to reach base, and Pat Burrell plated in a run with a sacrifice fly to bring the Rays within a run. However, the Orioles sealed the win as Akinori Iwamura grounded out to Johnson. The save for Johnson was his 9th of the season. Baltimore took the lead, 1-0, in the first inning as Nick Markakis plated in Cesar Izutris with an infield RBI-single, and then they scored twice in the fourth as both Melvin Mora and Jeff Fiorentino had RBI-singles. It was good to see the O's finally win, because things were getting horrible. I guess at this point, they just need to finish the season strong and avoid 100 losses. Last night, rookie pitcher David Hernandez got shelled and the Baltimore Orioles lost their 13th game in a row, 5-3, despite a late rally. Baltimore fell behind a never rebounded as Hernandez lasted only 4 1/3 innings, and looked like well, a rookie pitcher. Willy Aybar had an RBI-single in the second inning, Ben Zobrist hit a three run homer in the third, and Carl Crawford hit a solo shot in the fifth to add to Baltimore's misery. Hernandez's teammates could not get it started early, and suffered because of it. Ty Wigginton had a 2-run homer in the eighth inning, and Chad Moeller plated in a run with a sacrifice fly before the blast; however, it was too little, too late. Let's forget the season and look at why the Orioles, frankly, have sucked for the better part of a decade and more. MASN's Roch Kubatko on his blog has an excellent interview with Oriole legend and Hall of Famer Brooks Robinson about various topics - his life, health, and baseball; however, I want to focus on his comments about 2009 versus the infamous 1988 season. What he had to say was straight-forward, honest, and perhaps sobering. "I think the big problem with the Orioles is they've never had any continuity in the last 12 or 13 years. You can't just keep hiring managers and general managers. It just doesn't work that way. And every guy who comes in has got a little bit different philosophy on how he should operate. But if I was a betting man, I'd bet that Dave comes back. I'm probably in the minority, too. He's got an impossible task right now. There's nothing he can do. They trade (George) Sherrill, they trade (Aubrey) Huff, guys getting hurt in the outfield. They've got some pretty good players. They've got about five spots out there that are going to be there for a long time. "The pitchers are going to have a psychological problem. It's partly up here (points to head) pitching in this ballpark. You've got to make good pitches or balls fly out of this ballpark. I saw one game where (Pat) Burrell hit a line drive to right field and the runner was going to go back to third. He got about halfway there and he looked and the ball was in the stands. He just kind of shook his head. "You've got to score some runs in this ballpark. They need a big bopper there at first base. That's common knowledge. You've got to have someone to back up (Nick) Markakis. It might be tough to get guys to come here. Why would you go to a team that's lost 100 games this year, almost? And pitchers are like, 'Well, I'm not going to pitch in that ballpark.' You almost have to overpay them to come here. They've got a reputation now. They're losers, and they've got to turn that around. Fans have been saying that for a few years. But I follow the team, I pull for them. "I get asked all the time, wherever I go, 'What's wrong with the Orioles.' I always say they've got some good young players and I hope they materialize and get better. They have to." There's not much more to add what Brooks had to say. Yes, rebuilding a team is hard, and you're going to have ups and down with an organization; however, after all the losing and everything, fans have really lost interest -- they may care and follow what's going on -- but overall, no one is going to support a losing product.